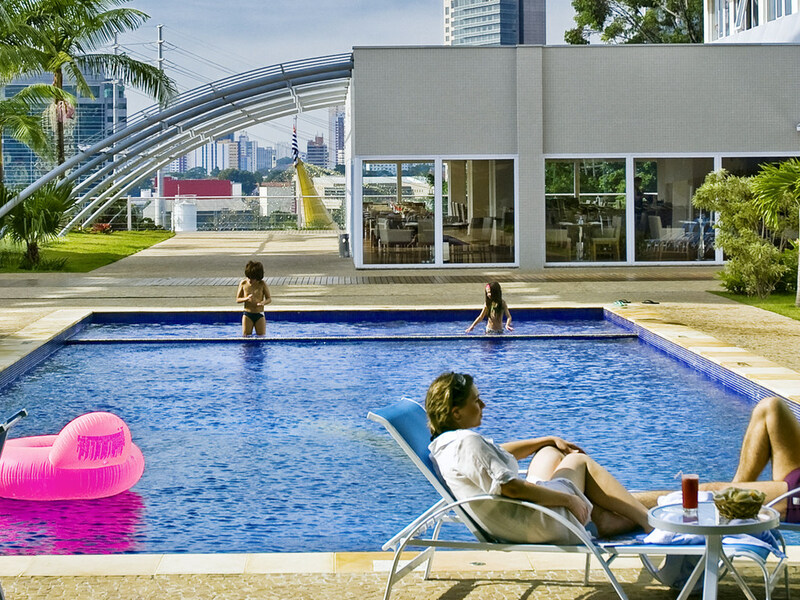 The Novotel SP Morumbi offers a privileged location and complete infrastructure for your business or family trip. The hotel is close to the Berrini region and the Transamerica Expo Center, close to Albert Einstein Hospital and Morumbi Stadium; Congonhas Airport is just 7 km away. The rooms are completely modernized and cozy, and we provide high speed WiFi 100% free of charge in all areas of the hotel. Our Leisure center has a swimming pool, gym, barbecue and playground integrated in an ideal space for you to rest. The hotel still has easy access to the Morumbi and Market Place shopping malls. To enjoy the city, you can visit KidZania or Monica's Park, ideal for families, or enjoy great shows at Citibank Hall or Tom Brasil, next to the hotel. Come and discover our feijoada at the 365 restaurant on Wednesdays and Saturdays. We also have live music on Saturdays and a kids' area. An excellent option in the heart of the city's South Zone, the 365 restaurant holds up to 200 people in its internal and external spaces with modern decor and quick, helpful service. The unrivalled views of the cable-stayed bridge are a must-see. The modern and relaxed 365 bar is the perfect place for a quick bite to eat or drinks, beers and delicious Brazilian snacks at happy hour. Guests can also enjoy watching sports on the big screen. Very good hotel. Location isn't great for walking, but very good for a short Uber ride. The view from the restaurant is excellent, but the food could be improved. Comfortable and quiet place in Morumbi. We really liked it here. Our family of four was happy. It was clean and quiet too. Just two suggestions: Maybe add more music so the same song doesn't play over and over throughout the pool area and lobby. It became a bit much. Also, maybe the bacon and eggs could be kept warm. Thank you for a wonderful, friendly stay! Prezada Sra Flaviana, Agradecemos por ter dedicado o seu tempo para nos avaliar sobre sua estada no Novotel São Paulo Morumbi. Sentimos por seus apontamentos sobre odor no corredor e serviço do restaurante. Obrigado por sua avaliação e esperamos ter a oportunidade de recebe-la em uma próxima estada e sanar essa má impressão. Cordialmente Rodrigo Neri Coordenador de Hospedagem. Fridge was very noisy, had to disconnect it to be able to sleep. There was a short circuit in the room during the last night, lights were out the next morning. The hotel is very clean and quiet for a good night sleep. The staff is very helpful and most speak English and really try to help. The breakfast is good as the made to order omelets are fantastic. The food at dinner is not so good and I will not eat at the hotel unless they improve the food options. I got a disable room with very low bed what is uncomfortable Bed sheet was coming out from the mattress Very dirty windows Very disappointing experience. I like Novotel in general, but this time was pleasant at all. I stayed at this hotel to accompany my son on a school trip. Considering the hotel had at least 60 children traveling with their schools over that weekend, I think they dealt very well with the situation. My only complaint regards the bathroom in my room. It was adapted for someone in a wheelchair, but the toilet lid was installed in a way that it was in front of the accessible bar behind the toilet. So, the person could not reach it. Also, that forced the lid in a position such that it kept closing on my back while I was sitting on the toilet. Could be better. There was some previous gest hair at the bathroom. At the bar/restaurant the personnel could not figure out how to accept the bill with the gest signature. After a long wait, we went to the bar. At the bar the first employee gave up, the second employee start everything again and said the problem was at the system and that we had to go to the front desk in order to correct the check in that was done wrongly. The staff is very helpful specially Jailton from reception. Loved the facilities and the breakfast. Guest since 1980,dawn of Novotel in São Paulo. Always enjoyed very friendly staff and opulent breakfast. My wife and I were escaping from blacked out, no power situation at our place in Morumbi. Reception it was very warm including a small cake but. Promising an outstanding stay. I couldn’t be such wrong. The shower simply didn’t heat-up.Took cold shower. Technician came and told me nothing was wrong(supposed to be my fault), Next day 6:00, morning shower: Cold one. No words.Breakfast was mean, poor in variety, with terrible Nescafé instant coffee machine. The shower case apparently is due to not so automated boiler. Human intervention is still essential. Prezado Sr Wilson, Agradecemos por ter dedicado o seu tempo para nos avaliar sobre sua estada no Novotel São Paulo Morumbi. Obrigado por sua avaliação e esperamos ter a oportunidade de recebe-los em uma próxima estada. Cordialmente Rodrigo Neri Coordenador de Hospedagem. Excelente estadia, staff mto atencioso e cordial. I really like staying in the Novotel Morumbi, it's close to the office, modern, and affordable. I stay and the Novotel Morumbi over many other choices. Have for years. It was the third time I had to stay in this hotel. The system didn't recognize my Le Club Status as Gold, so I didn't receive any special attention: no welcome drinks, no better room. I had to work in my room, but there wasn't any table and chair. Very uncomfortable. And the room (and the whole floor) had a strange smell. This time I found the staff a little bit more friendly, but that wasn't the case in my previous stays.